Every day, the cannabis and hemp markets are being enriched with innovative products and fancy-schmancy terminology to match. It’s easy to get lost in the flood of terms inundating the market. Fear not! We’ve put together a little dictionary to help you navigate this fascinating world. Cannabinoid: A particular chemical group that focuses on the effects of hemp (or cannabis) on our bodies and mental states. Cannabichromene (CBC): Studied for its anti-viral, anti-inflammatory, and pain relieving potential, CBC is also undergoing for research for encouraging the creation of nerve cells. Cannabidiol (CBD): This cannabinoid is the most common for hemp. It has become famous — with darn good reason — for its promising research on health benefits that have put hemp on the map, including: anti-inflammatory, anti-nausea, offering pain relief, seizure prevention, anti-cancer, blood pressure lowering, anti-anxiety, insomnia prevention, and much more. All of our hemp products are lab tested for CBD levels. Cannabigerol (CBG): Another incredible non-psychoactive cannabinoid, CBG is under review for its potential in slowing the growth of tumors in cancer patients. According to Medical Jane, another effect of CBG on the brain is that it inhibits the uptake of GABA, a brain chemical that determines how much stimulation a neuron needs to cause a reaction. When GABA is inhibited, it can decrease anxiety and muscle tension, which is similar to the effects of CBD. Cannabinol (CBN): A mildly psychoactive byproduct of when cannabis is exposed to heat and/or light. It has been found for many users to limit muscle spasms and is extremely effective for many people as an aid for insomnia. 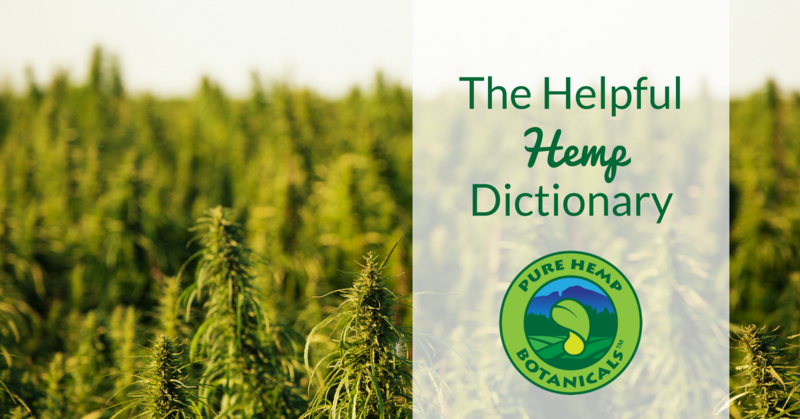 Phenotype: The defining characteristics of a hemp plant. These indicators help growers to anticipate the plant’s needs for optimal growing. Tetrahydrocannabivarin (THCV): Try saying that 3 times fast- yikes! THCV actually decreases the appetite, contrary to the rather overused jokes about how cannabis use turns you into a munchie machine. In addition, THCV is also being found to assist with seizures, which makes for some exciting research! Beta-caryophyllene: Identified by its signature spicy or peppery scent, it’s anecdotally known to be useful for ulcers, symptoms of Crohn’s disease, effects of autoimmune issues, and arthritis. Limonene: As the name probably tipped you off to, limonene creates that refreshing citrus sensation for fruits like lemon, orange, and lime. It’s being explored for its potential to assist in anti-bacterial and anti-oxidant contexts. Linalool: This is a delightfully relaxing terpene. Linalool is described as having a flowery aroma and may help ease anxiety and depression. Myrcene: It has an earthy aroma, and is known for its potential for pain relief and sedation. Pinene: Know that piney scent that you smell when walking through a forest? It’s most likely the result of pinene! This delightful terpene produces effects that can help breathing by assisting the break-up of mucus in the throat and lungs. With the winter upon us, this may be your best friend for the season! Terpene: Aromatic molecules consisting of hydrogen and carbon that produce synergistic effects with cannabinoids. Terpenoid: The terpenes once they have been “cured”, or exposed to drying/ heat. When they are cured, they have greater access to the blood stream. Trichrome: Trichomes are the “frosted” crystals that you find on the raw flowers. Trichromes are glands filled with cannabinoid and terpene-rich resins. They also act to protect the leaves, stems, and other parts of plant anatomy from the elements. Now you’re in the know! We’re always here to help with any questions you may have, so don’t hesitate to reach out to us! We geek out on all things hemp. Honestly, it’s getting us to stop talking about it that’s the hard part!